QR Codes and Microsoft Tags: What’s the Difference and Who’s Using Them? Many of today’s marketers, retailers, suppliers and more are using QR codes and Microsoft Tags to attract, retain and inform consumers. These 2D barcodes are plastered in magazines, bus stops, billboards, direct mail and even restaurant menus. They have consumed the marketplace and research shows that they will only gain in popularity. 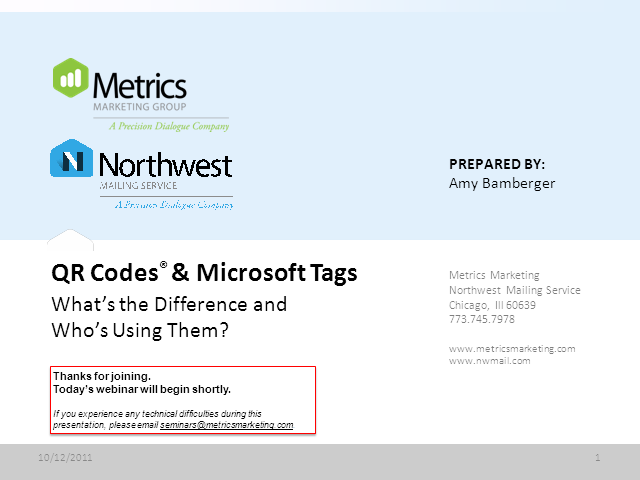 In this webinar, we will discuss the differences/benefits between QR codes and Microsoft Tags, and provide examples of how/where they are used in marketing. Title: QR Codes and Microsoft Tags: What’s the Difference and Who’s Using Them?